Home » California » Covelo » Marlatt TaeKwonDo Self Defense School Inc.
Marlatt TaeKwonDo Self Defense School Inc.
Marlatt TaeKwonDo Self Defense School Inc. is a Martial Arts School offering Hapkido, Tae Kwon Do & American (PKA) Kickboxing classes in Covelo, CA for kids, men and women. Marlatt TaeKwonDo Self Defense School Inc. is Located at 76091 Covelo Rd. View a Location Map, get Directions, Contact Marlatt TaeKwonDo Self Defense School Inc. or view program details below. If you are a student at this school, help your local Martial Arts Community by writing a Review of Marlatt TaeKwonDo Self Defense School Inc.. You can also help your school by sharing it on Facebook, Twitter, Google+, Pinterest etc. Monday thru Thursday Private lessons Available upon request. All classes taught by Qualified 2nd Degree Black Belts Instructors or above. Traditional Weapons Was Trained for 35 Years by his: Grandmaster Y.K.Park. Would you like more information on hours, classes and programs available at Marlatt TaeKwonDo Self Defense School Inc.? Please contact the school with your questions. Update the details, Write a Review or Report Error of Marlatt TaeKwonDo Self Defense School Inc..
View all Dojo in Covelo or in Zip code 95428. This Chart shows the Martial Arts Styles offered most in Covelo, California area. 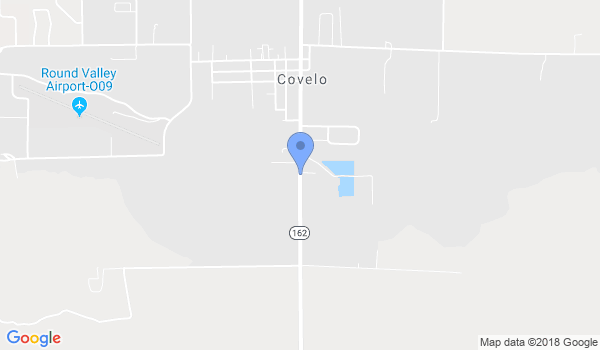 View a list of Dojo in Covelo, or enter your address below to find schools closest to you.